Around 27,000 people had joined the protests across the country by midday on Saturday, the Interior Ministry said. 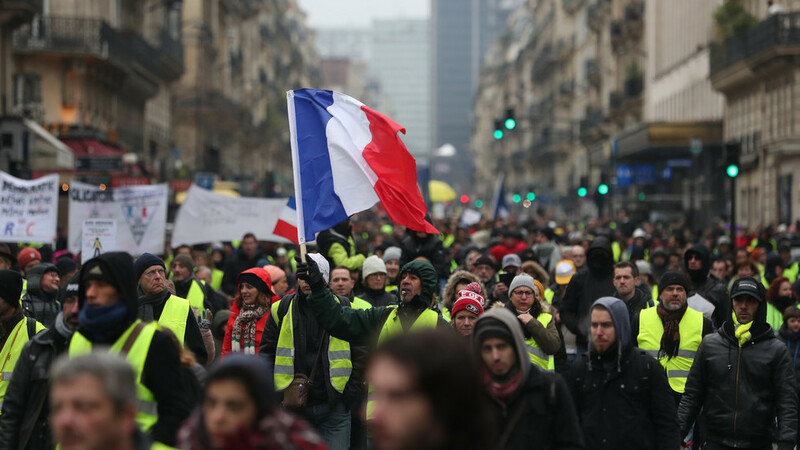 In Paris, the Yellow Vest occupied the Champs-Elysees and the Esplanade des Invalides near the nation’s parliament. People were seen waving national flags and setting off firecrackers. The law enforcers used water cannons to disperse some of the protesters in Paris. At least, 20 protestors were arrested in the capital for carrying illegal items, BFMTV reported citing the police. Armored police cars were filmed moving through the streets of the southern city of Toulouse. There were also reports of armored vehicles stationed in the capital. Twelve people have been detained in Paris for carrying weapons, police told BFMTV. They were apprehended during “random checks.” But overall, the rallies in the capital have so far remained peaceful, police said. Some protesters carried placards, reading "Freedom, Equality, Flash-Ball," referring to the type of ‘less-lethal’ guns used by law enforcement to quell the protests. The placards also contained pictures of Marianne – a national symbol of liberty – with an injured eye. That was apparently an allusion to a high-publicized incident in December when a young woman was hit in the eye by a projectile the activists say was fired from a Flash-Ball.